Daniel M. Knight is National Bank of Greece Postdoctoral Research Fellow at the Hellenic Observatory, London School of Economics and Political Science. His anthropological research focuses on the social effects of economic crisis in Greece. Knight holds a PhD from Durham University. Alex Katsomitros is a London-based journalist and researcher specialising in education, technology and innovation. In the past he has worked for the Observatory on Borderless Higher Education (OBHE) and the Association of Business Schools (ABS). Xenia Kounalaki was born in Hamburg in 1971. She has been a journalist in the daily newspaper Kathimerini since 1994 and a weekly columnist and head of the foreign desk since 2007. She contributes reports to „Spiegel“ and „Spiegel Online“. She has worked at the Greek Public Radio and Television as foreign news editor and presented her own TV program. 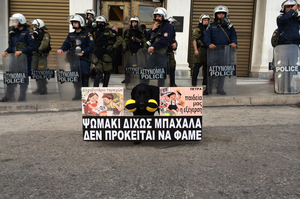 She has co-authored the book Βία (Violence) (Polis editions, 2012) on political violence. In 2012, she was awarded the international press freedom prize „Premio Internationale Per La Liberta Di Stampa“ in Florence. The English Pakistani writer, journalist, and filmmaker is a member of the editorial committee of the “New Left Review” and “Sin Permiso”, and contributes to “The Guardian”, „CounterPunch", and the "London Review of Books“. Ali is the author of several books, including “Bush in Babylon” (2003), “A Banker for All Seasons” (2007), "The Duel“ (2008), “The Obama Syndrome” (2010), and “The Extreme Centre: A Warning” (2015). Jon Wiltshire is a freelance journalist, living and working in Athens, Greece. He recently graduated from the London School of Economics. He blogs and tweets about the effects of the Eurozone crisis on Greece. Stylia Kampani has been active in different European youth organizations including the Young European Federalists (JEF) where she is currently serving as Editor-in-Chief of the New Federalist magazine. She studied International and European Studies in Piraeus and Bremen, and now continues her graduate studies in Political Economy in Berlin. She is also assisting the work of Jacques Delors Institute and is part of the Young European Collective whose members contribute to the column “Who, If Not Us”? Michalis Spourdalakis is professor of political science at Athens University. The Greek people must be bold enough to refuse any further austerity. Not only for their sake, but also for the sake of European democracy. 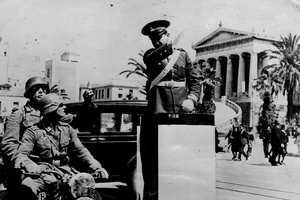 Germany bears responsibility for Greece. But that has nothing to do with World War II.